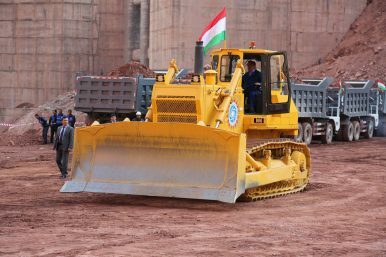 Tajik President Emomali Rahmon rides a bulldozer during the restart of construction at Rogun in November 2016. This week, Asian Development Bank (ADB) President Takehiko Nakao made a three-day visit to Tajikistan, meeting Tajik President Emomali Rahmon and other members of Tajik government. The ADB seems optimistic about Tajikistan’s economic performance, despite the country’s fragile economy. The bank recently revised its growth forecast for the country up to 5 percent for 2017. The World Bank also recently revised its outlook for Tajikistan, but lowered its expectations from a 2017 forecast made in June at 5.5 percent to 5.2 percent in October. These are small and speculative variations but as both international development banks estimate Tajikistan’s growth in 2016 at 6.9 percent, they still mark a decline in growth. Nakao and Rahmon attended a groundbreaking ceremony for the Dushanbe-Qurghonteppa road rehabilitation project. The project — expanding the vital north-south road to four lanes, resurfacing it, and adding safety features like road signs, lighting, pedestrian crossings, and bus stops — is supported by $65 million in ADB financing for the initial phase. This isn’t to dismiss the value of road projects as part of poverty reduction programs, but in countries like Tajikistan, with autocratic political structures lacking transparency and accountability mechanisms, the opportunity for corruption and abuse of development project funds is high. That said, connectivity is a problem for Tajikistan. The World Bank notes that economic connections between countries — whether from international trade, foreign investment, migration, or infrastructural connections — “play important roles in furthering economic growth and innovation.” In a comparison of connectivity in the Europe and Central Asia region by the World Bank, Tajikistan ranked among the countries with the lowest connectivity. But there were plenty of others willing to take the risk: Tajikistan reportedly got more than $4 billion in bids for the $500 million in bonds. According to Reuters, Tajikistan’s presentation to potential investors highlighted that the funds received would be directed to the Rogun dam project. The presentation also apparently highlighted 2016’s 6.9 percent growth rate (but perhaps did not mention the 5 percent forecast for 2017). Investors were reportedly drawn in by “Russia’s tacit backing for the small central Asian country” and the sense of the Rogun project. But regional watchers will know that Rogun is far from a simple, straightforward project. Not only is the dam — planned to be the world’s tallest — technically difficult, but it’s been challenged by Uzbekistan, which sits downstream. Improved relations between Uzbekistan and Tajikistan may alleviate the nasty tone of previous disagreements over the dam, but do not necessarily resolve the core complaints. Nevertheless, investors seeking returns in a cautious global environment put down the cash. According to a source that spoke to Bloomberg, more than 60 percent of the bonds went to U.S. and U.K. investors. The Rogun dam has been an idea since 1959 and construction started, the first time, in the 1970s. When construction began again last November, the projection was to have two of six turbines operating by 2018. An Italian company won the $3.9 billion contract to build the dam last summer.